Tweeting in church? A pastor “checking in” with a video post taken with his iPad as he welcomed people to worship? Another pastor tweeting prayers during the Prayers of the People? Selfies? SELFIES IN WORSHIP??? These were just a few of the wonderful and odd things that happened at Social Media Sunday at Winnetka Presbyterian Church (Winnetka, IL). Over the next few days, I’ll be sharing about our experiment of Social Media Sunday, and will hopefully provide you with information that will be helpful if you decide you’d like to do a Social Media Sunday at your church. I heard about Social Media Sunday from the #chsocm Twitter conversations, and then looked at some materials that Carolyn Clement (@singingcarolyn) had shared about the Social Media Sunday that occurred at Trinity Episcopal, Tariffville, CT. It came up in a staff meeting a few months ago, and we started thinking about the idea of what that might look like at WPC. However, once we decided to do Social Media Sunday, it quickly became clear that we weren’t all in full agreement about the role of social media in worship. While our Director of Music was fully on board with social media as a communication tool for the church and a way to build connections, he struggled with why it should be used in worship (full disclosure: I asked him about this blog post, and he said he was fine with being mentioned). 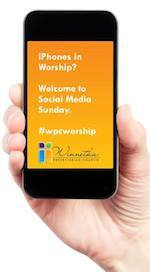 If you decide to do a Social Media Sunday, you both need to be prepared for a vast array of perspectives and thoughts on whether social media should be used in worship by folks in your congregation, but it is also possible that you may encounter that same diversity within your staff, as we did at WPC. We had some lengthy conversations about our hopes and goals, and we talked about how we could situate Social Media Sunday as an adventure, an experiment, and an opportunity to get a better feel for our own community’s social media activity and presence. I think the conversations that we had within our staff were extremely helpful, in that it gave us the opportunity to really think about Social Media Sunday not as something to do because all the cool churches were doing it, but because we genuinely wanted to engage new media with worship and see what happened. No matter what the thoughts of your staff are, even if you’re all in agreement, it’s helpful and important to have some conversations about why you’re doing Social Media Sunday – it will help your experience be more of a success. Social Media Sunday, Part 5: Will we do it again? Terrific post made even more terrific by how you model sharing and shared wisdom within the community of people who use the #chsocm hashtag!